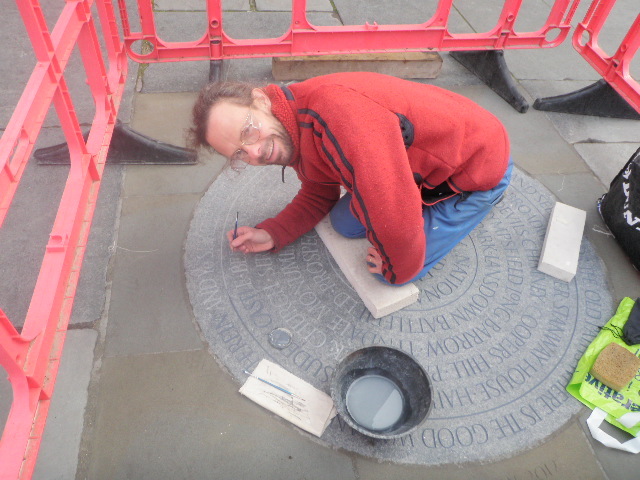 On my knees, painting the letters in situ on Saturday. Thanks to Bella Gingell for the photo. A big day today. The public unveiling of the Marker at 1.45. I will post some pictures later! Congratulations on the unveiling, Iain. I just retuned home in time to pick up my messages so have tweeted this as the unveiling takes place. (Nice photo). Congratulations Iain, the mammoth task was worth it, looking forward to heading into town and having a good look. Brilliant! My friend Gill and I finish the CW on Sunday 28th about 12:30ish in Bath(having started it about the same time as you started the stone coincidently) and now we will know exactly when we get there and sure there will not be many who will have done it before us, so very excited. Thank You!